For the first time in our Herculean history, we will organize a Hercules Trophy in Abu Dhabi. 11th November will be the inaugural date for a private Hercules Trophy dedicated to Daman Health Insurance. Daman is the health insurance company that excels in the region thanks to a new vision and their ambition to have an impact on employees’ health in UAE companies. Daman has been the title sponsor in Dubai for 2 years now and I’ve had the chance to get to know the organisation better. The way the vision is carried out through all echelons in the Daman hierarchy is striking. I haven’t met one single Daman employee who isn’t obsessed with exercise and health. In less than 1 year time, a lot of employees have lost weight and do work-outs several times per week. They’ve changed they way they eat, work, sleep, exercise and they monitor it all with one of the current monitoring devices or apps. Daman will also organize the Corporate Health Awards on 4th November for the second time, a gala event that welcomes the companies that are leading in corporate wellbeing in the region. Daman also partners with other sporting events like The Color Run or the Electric Run, events that don’t require specific athletic skills, just like the Hercules Trophy. These events are promoted towards their employees internally and have become a part of the DNA of the organisation. The internal Herculean vibe came to life within Daman, sometimes a bit fanatic. The best Daman team at the Dubai Hercules Trophy was offered an exciting trip to Europe in order to take part in the Belgian Hercules Trophy in June. 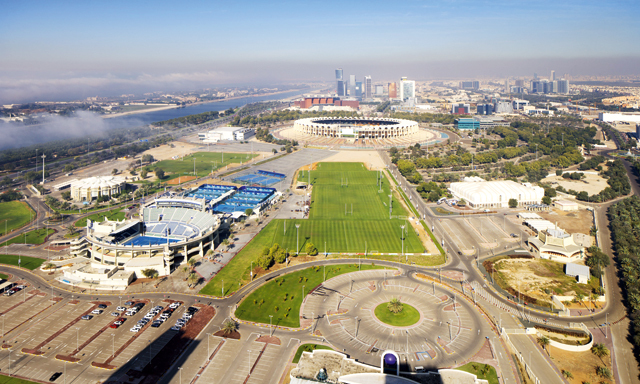 The next step seemed inevitable: organize a private event for 1,000 Daman employees only a few miles away from the new Daman building in Abu Dhabi: Zayed Sports City. The Employee Day was called Daman’s Evolve Staff Meeting. The internal vibe and friendly competitive spirit is rising day by day, which has a genuine effect on the team spirit within the organisation. I feel privileged to be a witness of the remarkable journey that Daman went through. I met people from all corners of the world (Noura, Andy, Mansour, Katja, Gia and many others) who unite around the vision of this relatively new company. For me, this metamorphosis is exemplary for what this country is going through. It emanates a feeling of hope, optimism and change. On 6th February 2016 we will have the Hercules Trophy in Dubai at the Sevens Stadium. 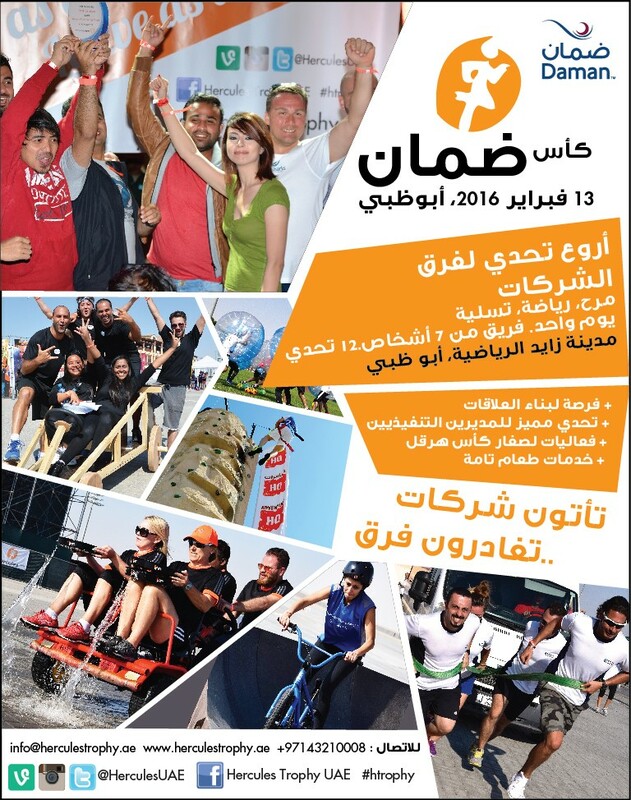 The first public Hercules Trophy in Abu Dhabi will take place on 13th February. Both events sponsored by Daman. I hope that the inhabitants of Abu Dhabi will follow the example shown by Daman and will soon be convinced by our herculean spirit.